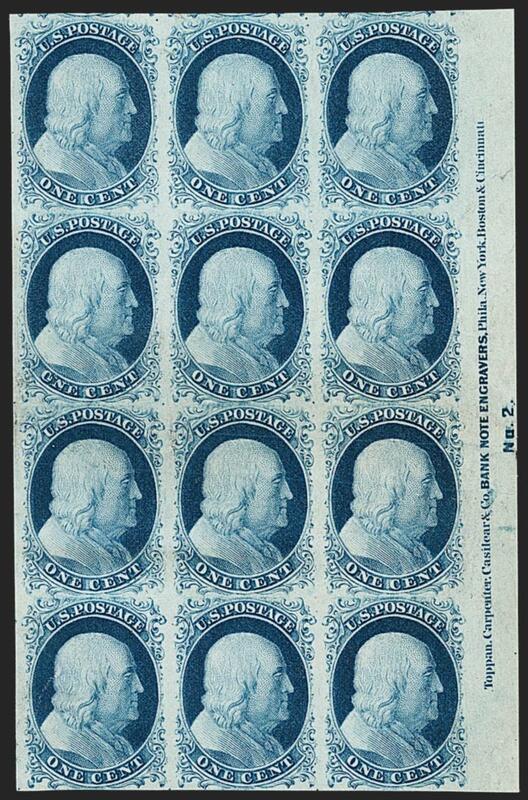 The 1¢ 1851 stamp, with a bust of Franklin based on Caffieri's sculpture, was one of the workhorses of postage stamps issued during the decade it was current. To print enough 1¢ stamps to meet demand, twelve steel plates were made--one was never used (Plate 6), and the first plate was reworked to add life to it (thus, the Early and Late states). 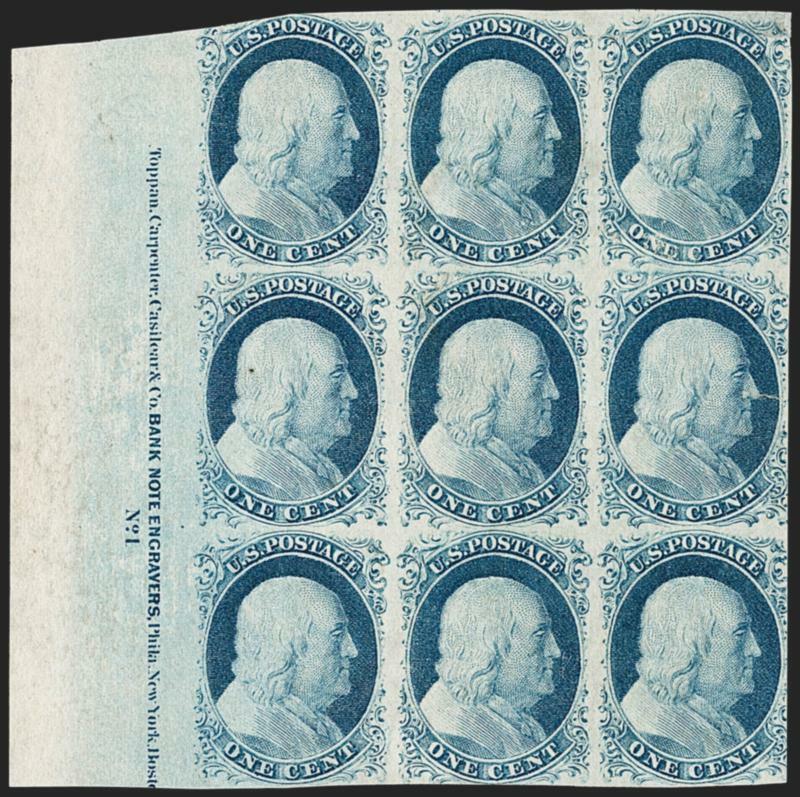 The 1¢ Franklin stamps printed from Plate 4 were issued in April, May and briefly in June 1857, shortly before perforations were introduced into the stamp production process. Two 1¢ types listed as major Scott Catalogue numbers were produced exclusively from Plate 4--Type Ia (6 or 19) and Type Ic (6b or 19b). Type Ia shows the complete ornamentation at bottom, including the plumes at bottom left and right. 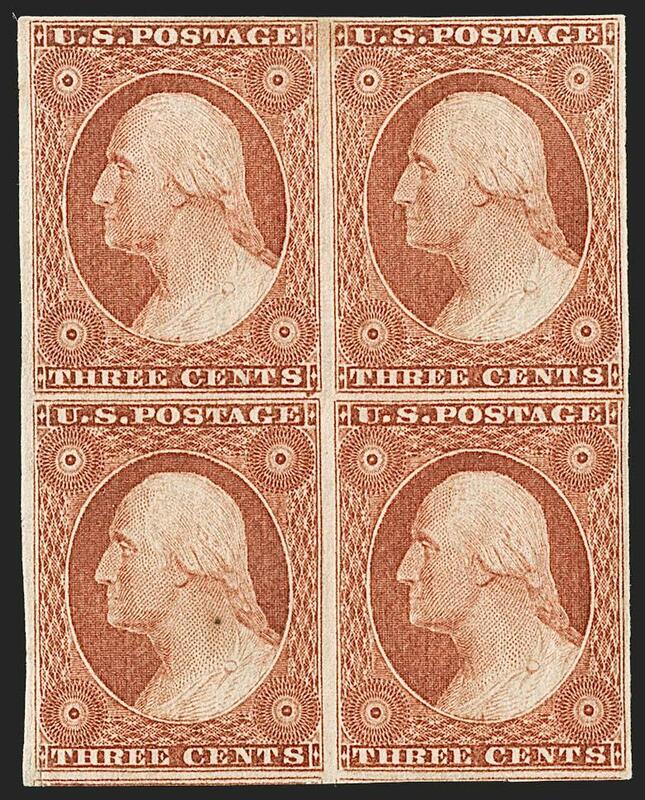 That makes it instantly recognizable among imperforate 1¢ 1851 stamps (Type Ic is nearly complete). 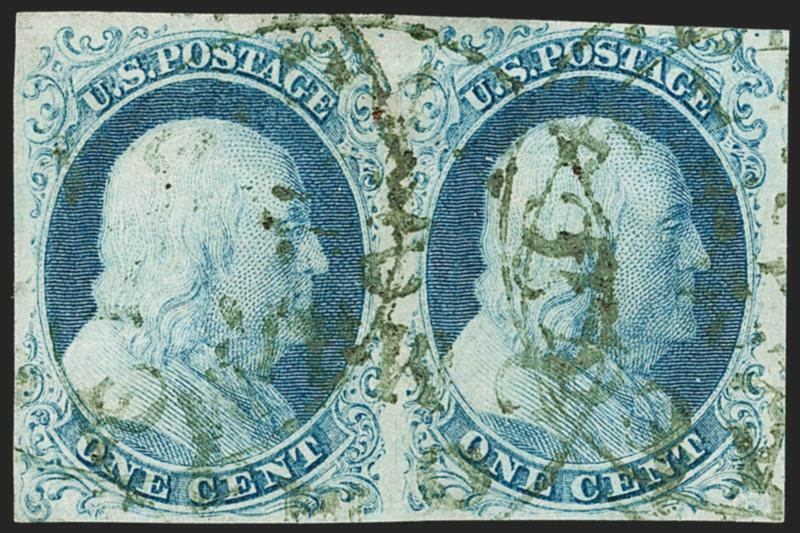 Plate 4 stamps were issued both imperforate and perforated, but the relatively smaller production of imperforate stamps explains the great rarity of imperforate versions of Types Ia and Ic from Plate 4. Type Ia stamps were furnished by only 18 of the 200 positions on Plate 4 (the remaining two bottom-row positions are sub-type Ic). Therefore, statistically, Type Ia positions represent 9% of all Plate 4 production, either imperforate or perforated, and only 1.8% of all imperforate stamp production from all plates. John C. Chapin, A Census of United States Classic Plate Blocks 1851-1882, census no. 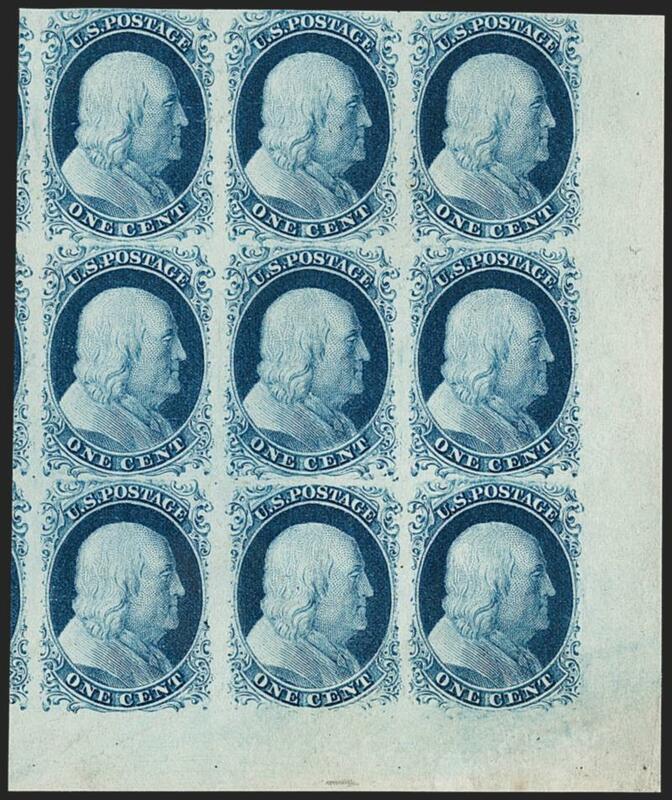 4, note on page 6: "4) The cutting-up in 1980 of the only known pane of the 1 cent blue, Type II, of 1851 (Scott 7), which had been in the Hind, Neinken and Ishikawa collections"
Plate number strips and blocks have been popular with collectors for many years, but the presence of an imprint or plate number on a stamp or multiple issued prior to 1888 is unusual. The simple reason is classic issues rarely survived in sheets or multiples with intact imprints. When Toppan, Carpenter, Casilear & Company made the first plates used to print the 1851 Issue stamps, they did not bother to add imprints or plate numbers until 1852. 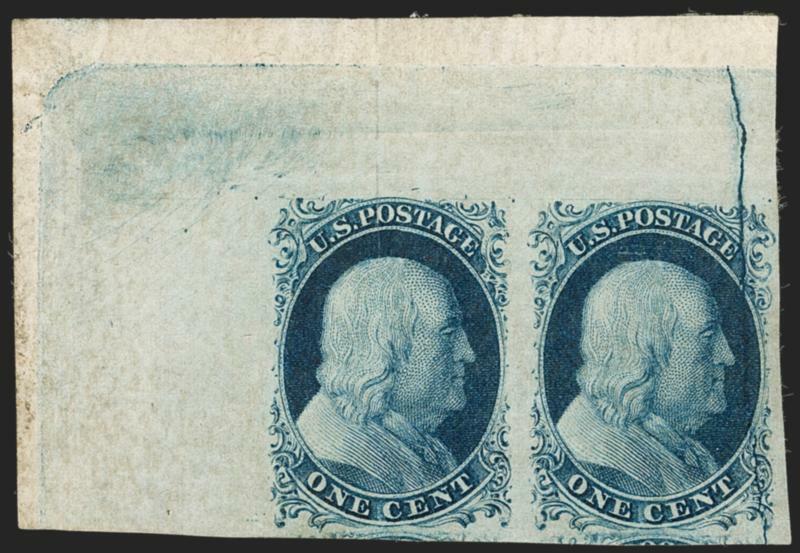 Very few plate number blocks of the 1851 Issue exist, and only two full plate blocks (of eight or twelve stamps) are recorded for the 1¢ Type II, and they both come from Plate 2. 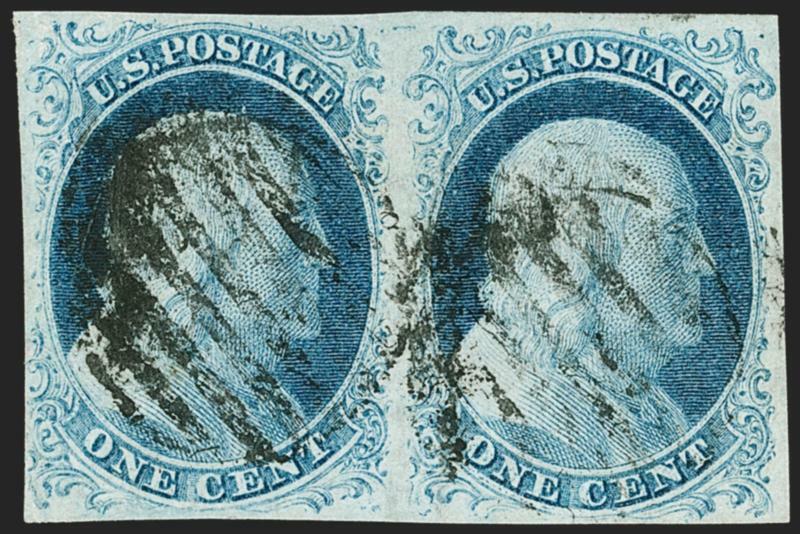 The plate block offered here is the finer of the two (the other has ink spots). 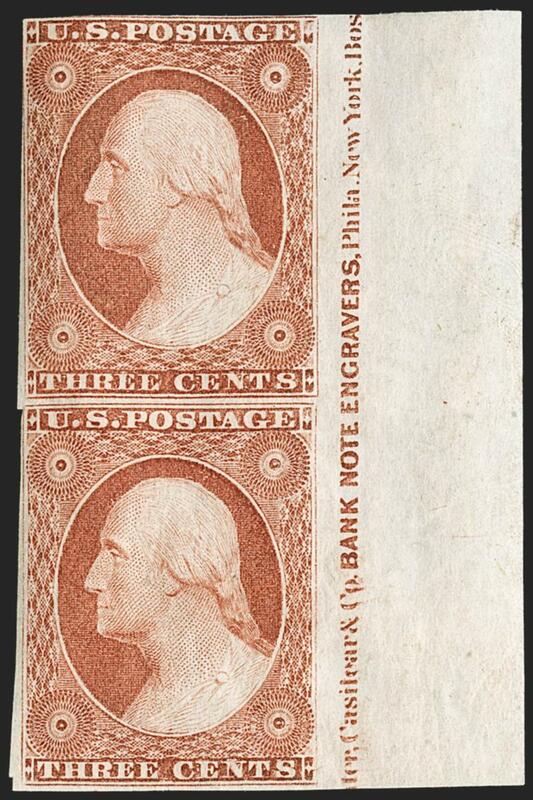 14° Magnificent corner-margin pair of 1¢ 1851 Imperforate with the striking Plate 2 "Big Flaw"
Plate 2 was made in late 1855, and produced 198 stamps that are Type II, one position that is Type III (99R) and one that can be either Type II or Type IIIA (100R), depending on plate wear. The creation of the Type III (99R2) and the 89R2 major double transfer is a story of human error. To lay out the plate, the siderographer used a tool to make tiny dots in the plate that served to guide him in rocking in entries from the transfer roll. Positions 79 and 89 were transferred perfectly using their guide dots. However, the guide dot to the southeast of Position 88R2, which was used to align the single B Relief for Position 99R2, was placed far out of line. The misplaced dot caused the siderographer to transfer the 99R entry far out of alignment and rock the adjoining A Relief on the transfer roll into the bottom part of Position 89 (and in the margin below this position). The first 99R entry was erased and re-entered, but the parts of the A Relief transferred into the bottom of Position 89R remained. When the fresh entry was made in Position 99R, a full transfer of the design was not possible without running into the error in Position 89R. The position was therefore short transferred at top, and apparently also at bottom, creating the finest example of Type III found on any plate (see pages 183-184 of Neinken book). A sixth block, ex Hessel and Klein, was reduced to a pair after the 1988 Klein sale. The perforated block is unique.